Geoffrey Gowlland was an enthusiastic amateur photographer and shot many hours of 8mm cine film. Of particular interest nowadays are those films taken between 1937 and 1950. His still photographs remain in family possession; but some ten years ago Rosemary and John decided to deposit the cine films with Screen Archive South East (originally called South East Film and Video Archive) - for whose website click here. The films are now correctly stored under archival conditions and have been fully catalogued. The films were deposited with no copyright restrictions, but we asked that we should always be notified of any potential usage. Over the last few years several different excerpts have been found by enquirers and researchers and used for a variety of purposes. These have included scenes of winter time during the Second World War and a family celebrating Christmas in 1950. In 2004 a sequence covering the years 1944-45 appeared in a presentation entitled ‘Surrey on Film 1914-53', produced by the Surrey History Centre, in association with Screen Archive. This is still available and details can be found on the Surrey County Council website - click here and follow the link at the bottom of the page "Find out More". The previous evening, 12 May 2005, BBC London News contacted Rosemary and John to arrange an interview for transmission during the 1830 local London news on 13 May. Interviewer Tom Edwards visited John’s house and discussed with us Geoffrey’s films and our recollections of those times. Then we all visited Lloyd Park, the location of the anecdote Rosemary has told of the three children out on a family walk with their mother and realising that a descending V1 appeared to be heading for the family home. For some pictures of the day, click here. Just before these programmes were transmitted an illustrated feature article appeared in the Croydon Advertiser newspaper. In December 2007 there was another similar approach via Screen Archive, this time on behalf of an ITV series ‘The Way We Were’. As before, we talked first to a researcher, during which we found that their interest was in using extracts from a selection of amateur film footage taken throughout the Second World War. 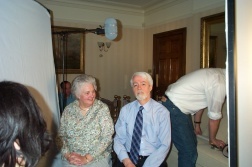 On 10 January 2008 producer Alison Starsmore with director Jane Jarvis, a cameraman and sound recordist, spent the afternoon at John’s house filming and interviewing Rosemary and John separately. For some pictures of the day, click here. This programme was transmitted on some ITV channels in August 2008. In April 2009 there was a direct approach from a researcher on behalf of a French Television Company, letting us know that they were interested in possibly using some footage and asking if we were prepared to be interviewed. We responded that we were, but heard nothing more and assumed that the project had been shelved. To our surprise in early August 2009 an email came from the National Geographic satellite television channel notifying us that the French production had been completed. It was to be called ‘Apocalypse’ and comprised six episodes each of nearly one hour. These were to be shown in September as double bills on the main French television channel and transmitted in prime time viewing, after their main evening news. But in England they would only be shown on the National Geographic channel on six consecutive weeks. During September we heard that the series had made a big impact in France and been very well received there. For the website click here. Rosemary was interviewed by several French journalists (fortunately always in English!). As a result, a short article appeared in the French newspaper 'Le Parisien' on 15th September, and another in the French magazine 'France Dimanche' on 2nd October. A media company in England was also asked to interview us and get some photographs. After this was done the 'Daily Mail' newspaper took an interest and published a double spread on 16 October 2009, showing various photographs with comments by Rosemary or John. For a picture of the article, click here. In May 2011 an approach was received from Julian Hendy, an independent producer, who was planning a documentary about the Festival of Britain. He had been in touch with the Archive and was particularly interested in the sequence about the Battersea Pleasure Garden. After discussions on the telephone he, together with his cameraman and sound recordist, visited Rosemary's house to record interviews with us both. The finished programme was shown on BBC2 in September 2011 and was very well received by the critics and those who saw it. John and Rosemary both found it fascinating and had many appreciative comments from family and friends who also viewed it. In October 2011 Screen Archive notified us that a section of an early wartime film had been selected as one of the Home Front films to be incorporated into the online virtual reality resource designed to support Key Stage 3/4 pupils learning about life on the Home Front. How amazed Geoffrey would have been at all this media interest in films taken originally solely for family interest! To return to the Contents page, please click here. 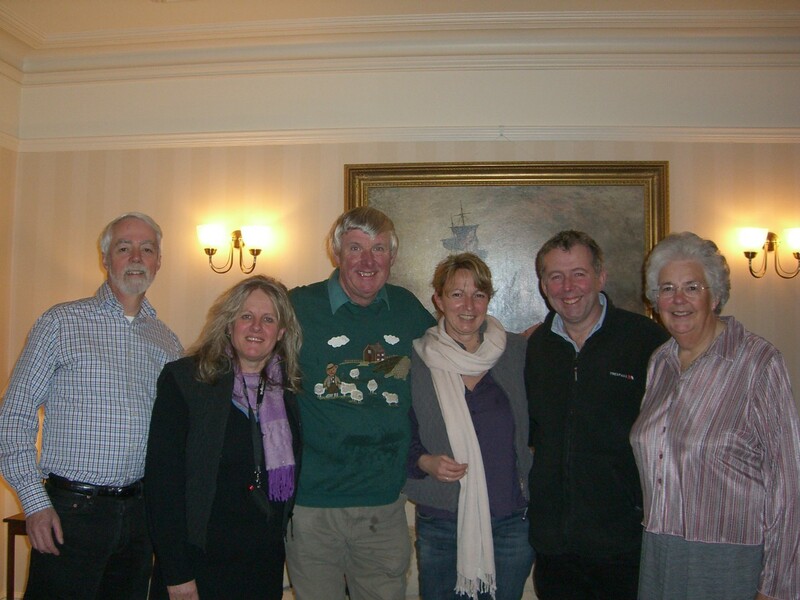 Ros Baines and team on 7th March 2005 . . . .
And secondly Tom Edwards and team on Friday 13th May 2005 . . .
10 January 2008 Producer Alison Starsmore,director Jane Jarvis and the rest of the team. "Daily Mail " October 9th 2009. In January 2013 John and Rosemary were interviewed by Gillian Edom as part of the Screen Archive South East Oral History Project. Some parts of the Gowlland films have recently been included in a new film produced by the Archive about childhood. This was very interesting to watch and should elicit responses from those who see it: it certainly did for the two of us watching it since, as usual, the images triggered memories from many years ago.